Airline Transport Professionals (ATP) today accepted delivery of a factory-new, multi-engine Piper PA-44 Seminole aircraft. This is the ninth 2008 model Piper Seminole received by ATP this year, with one more aircraft to be delivered by year-end. Airline Career Pilot Program students fly the multi-engine Seminoles for 140 hours in a nationwide, airline-style training environment. With the addition of this aircraft, ATP's fleet now includes 145 flight training aircraft: 89 multi-engine Piper Seminoles, 50 Cessna 172s, 5 Diamond Stars and 1 Cessna CitationJet. Even in a weakened economy, ATP continues to demonstrate a strong financial background with the acquisition of new aircraft. ATP recognizes that there is a fundamental pilot shortage and that the recent slow down in hiring is merely short term. ATP President Derrick Dennis stated that, "The airline industry is in a cyclical downturn but we’ve seen this before and know the hiring will return. This is the time to begin flight training so that prospective pilots will be qualified to enter the market when hiring increases in the near future. Those pilots who prepare themselves now will have the experience to enter the market first and will have the seniority to upgrade to captain sooner. 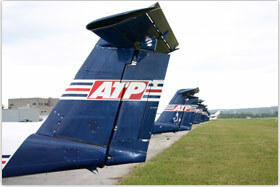 ATP has always led the flight training industry and we will proceed with plans to add new multi-engine Piper Seminoles and new Diamond D-JETs to our fleet. This will enable ATP to hold its position as the leader in airline pilot training and pilot career development."